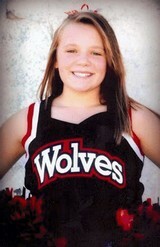 I have done many stories on Hailey Dunn so put her name in the search box above to read them all. Shawn Adkins, 25, is the live-in boyfriend of Billie Dunn, whose 13-year-old daughter, Hailey Dunn has been missing for 21 days. Through out the video you see Adkins, smoking an unknown substance, then pretending to drive a boat and then playing the paddle like a guitar. The video goes on for over two minutes. If anyone knows the location of this boat that Shawn is sitting in, please contact me. Early this morning police received a tip that Hailey was spotted in a pickup on Highway 208 going towards Scurry County this morning and it turned out to be a false alarm. “They checked out a possible sighting, but there was no substance to it,” said Pete Kampfer, spokesman for the police. Over the weekend, volunteers searched Mitchell, Howard, Scurry and Nolan counties and an Abilene landfill in Texas. 1/7/11 Thursday night, Billie Dunn, Hailey’s mother on the Nancy Grace show said that both she and her boyfriend, Shawn Adkins had failed polygraph tests. Billie says that Shawn failed the test first, so she volunteered to take a polygraph test, too. She quickly added that they had both been taking medication, Ativan, to help them sleep and that may have affected the results. Billie says she didn’t know what to think anymore, so she asked Shawn to leave her house and he was currently staying with his grandmother. “He was very careful and said he would go,” said Billie. Hailey, 13, has been missing since December 27th, after she left her home saying she was going to spend the night with a friend. She has not been seen since. A scent trail that was followed by dogs led to a door of a ground-floor room at the two-level Western Suite motel that opened in July, but there the trail stopped. A search of the each hotel room produced no other evidence. Cristie Roye, manager of Western Suites, said police studied surveillance tapes but did not see the missing teen.